St. John’s/St. Ann’s Food Pantry has provided our neighbors in the South End of Albany with emergency supplemental food for over 25 years. The Pantry provides sufficient food for 3 meals for 3 days or a total of nine meals per month for each individual registered to a household. It also provides toiletries (which cannot be purchased with food stamps), infant formula, baby food and diapers when available. The neighbors we serve learn about us from a variety of sources including health and human service organizations, family, friends, and neighboring churches. Client eligibility is restricted to the geographic area defined by the Food Pantries of the Capital District, and clients must bring a proof of address when coming in. The Food Pantry has implemented a program called “Client Choice”, which enables our neighbors to decide which foods their families need and like. This highly reduces the likelihood of any food going to waste. Most of our clients come into the pantry to pick up their food but physical limitations preclude some of them from coming in. We offer these clients the opportunity to have their food delivered. We are blessed with a wonderful group of dedicated volunteers who help make this possible. Food is currently delivered to 85 individuals in 40 families. In June of 2012, our Pantry served 635 individuals and in August of 2012, it served 759 individuals. With the economy the way it is at the present time we are expecting to see an increase in demand for our Food Pantry in the next year. 10:00 A.M. – Noon, 1:00 P.M. – 3:00 P.M.
You must show current proof of address every time you pick up your pantry. 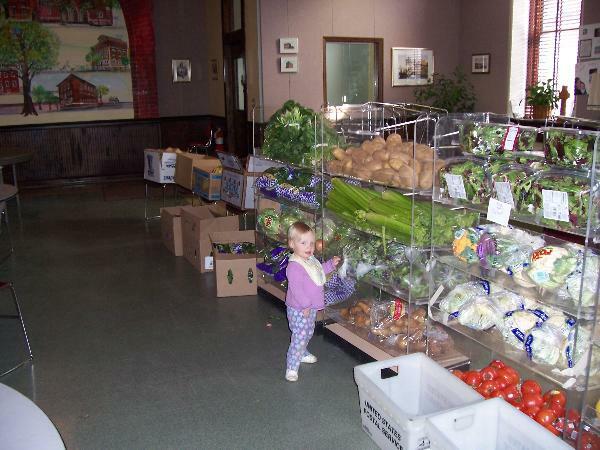 A young visitor inspects the produce which is offered Mondays and Thursdays. 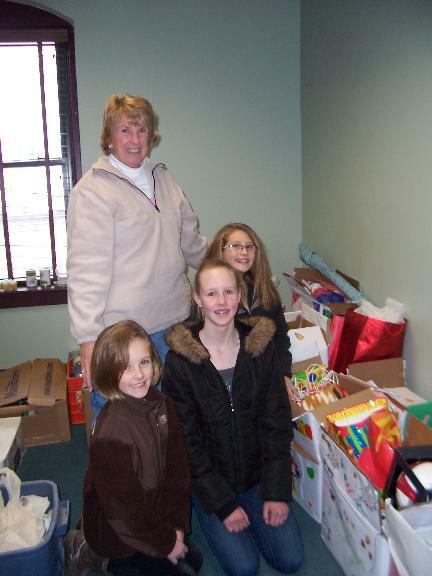 Center Director Barbara Quinn with Girl Scouts who prepared and donated birthday bags for center patrons.